Some say that love is the universal language, the one everyone understands. Others say that language is music. The learned set has a valid argument that claims that if/when we do talk to an intelligent, extra-terrestrial species, we should do so through mathematics, because one thing plus one thing equals two things, even if their word for “two” isn’t the same as ours. However, Live Aliens, the developers of the roguelike shoot-em-up Atomic Heist, have a theory of their own of the one thing everyone understands – thievery. An alien race has stolen the power core from the Hyperion-6 space station. Your task is to get the core back, but there are risks involved. You see, the power core is leaking radiation, slowly depleting your health. Your enemies will attack you on sight and are unafraid to charge you head-on. The weapons at your disposal are those you collect along the way, and they may (or may not) be well-suited to the enemies you are facing. Oh, and they may well damage you, too. All of a sudden, just buying another one seems like a far safer solution, but where’s the fun in that? 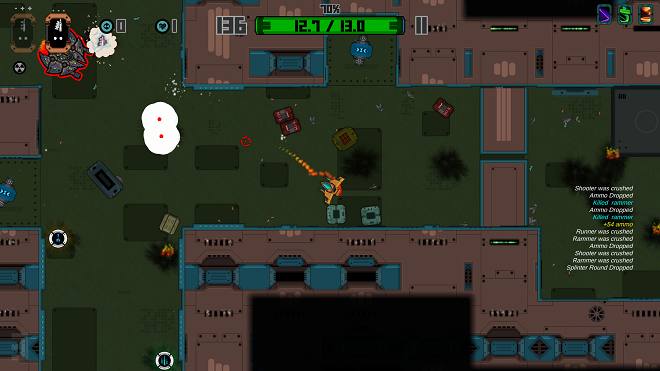 Random adventures –Levels in Atomic Heist are procedurally generated, as are the power-ups that enemies drop upon their destruction. This reminds me very fondly of one of my favorite shooters, Neon Chrome, where each play-through is a truly new adventure, keeping you coming back for more. However, you have more control over your ship’s starting parameters. 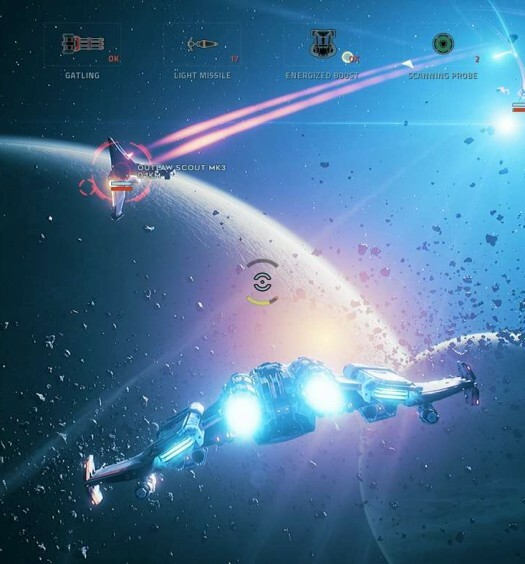 The ship selection option lets you choose starter power-ups, buffs and even a range of ships (as you unlock these features) with different abilities. This allows you to start the game with at least one component as a constant, an important point in a game based on randomness. However, if you want to jump in blindly, try the daily mode option instead, which assigns you a ship with random parameters and throws you into the fray. Got the basics down – The game uses colorful 2D sprites and backgrounds to appropriate effect. Hit flashes tell you clearly if your weaponry is effective against the target or not, giving you the chance to swap to another option if you have one handy. 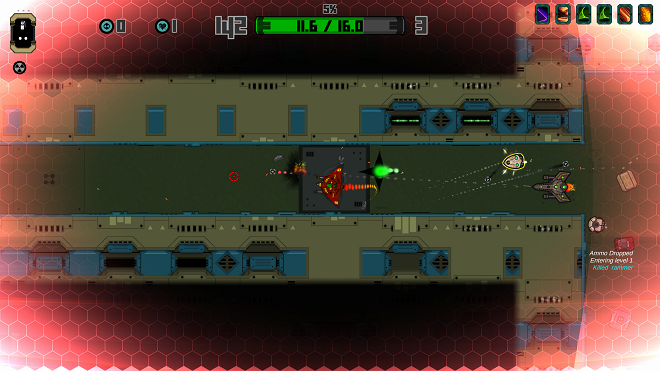 Control-wise, Atomic Heist uses a twin-stick scheme that makes it easier to strafe enemies in narrow passages or scoot through obstacles. However, if you wish, you can play the game just using the Left Stick to point and direct your ship. 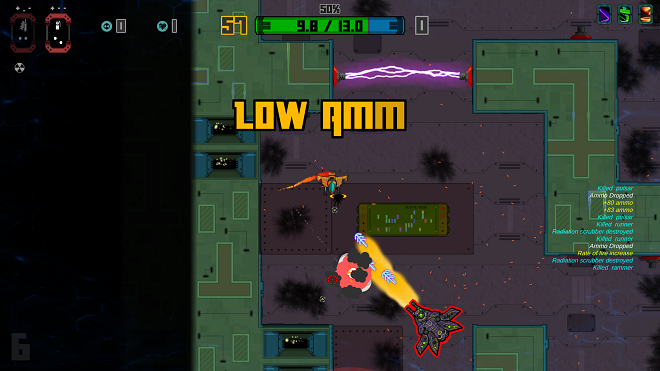 Right Trigger controls your main weapon, while Left Trigger drops your super-weapon of choice. Lastly, the D-Pad manages your weapons systems, selecting between your main and super-weapons, as well as adjusting firing rates. Decisions, decisions – Players will find themselves trying to make decisions at very inopportune times. For one example, if you run across a new weapon power-up, you need to determine if its pros and cons (all have both) will work in your current situation, or perceived future situation. Since you can have two weapons handy, the new item may prove to be a viable backup if you’re approaching a boss level. Also, if you manage to completely clear a level of enemies (not too hard a task, most of the time), you can add a power-up near the start of the next level. Those power-ups also have a drawback alongside their bonus; for instance, you may be able to reduce enemy HP by a certain percentage, at the cost of decreasing the size of ammo pick-ups by another percentage. Fortunately, these power-ups are optional, and you can back out without making a choice if none look promising… or something else happens, as will be explained in a moment. Punishing difficulty– Like other roguelikes, Atomic Heist will give you good runs, providing you with appropriate weaponry and plenty of buffs, intermixed with a ton of bad ones. Even if you do get lucky, your enemies will give you no quarter. None of them are cannon fodder and will cause you problems even if they appear harmless. For instance, a small rammer may be hiding out behind a much-needed scrubber, a handy tool that brings your radiation level down, thus giving you more overall health – and one that only takes one stray bullet to destroy. Then there are the larger enemies and bosses that will often catch you unawares and one-hit you back to the main menu. Little time to breathe – As noted earlier, sometimes you find yourself backing out of some decision making not because you changed your mind, but because you’re under assault again. Many other similar titles do let you take a moment to make a choice (for example, Neon Chrome has its chambers that pause the game as you select a new enhancement), but in this one, it’s up to you to clear out the area and be ready to react at a moment’s notice. Considering that almost all the in-game power-ups have some sort of downside, having time to think is critical to a long run. A good game should give you a reason to return to it frequently, and Atomic Heist has that quality without question. Yes, it’s challenging and occasionally frustrating, but it’s so enjoyable you just have to try it again and see if you can get farther. Fun games get my vote, and fun, cheap games are even better. With an exceptionally low price, Atomic Heist makes an occasional bout of radiation sickness far more palatable, so get back in there and retrieve that core! Atomic Heist was developed and published by Live Aliens. It was released on April 20, 2018, for $10.99. The author used their personal copy of the game for this review.